With the constantly increasing security threats in the information technology landscape, protection of valuable intellectual property and business data against theft/misuse without interrupting business continuity is a critical issue. Prevents Data theft, Productivity loss and Security violations. Assists in monitoring devices that are connected to the system. Using the Password Protection feature, unauthorized devices can be easily blocked. The new Secure Web Interface uses SSL technology to encrypt all communications. eScan ’s summarized dashboard provides administrators the status of the managed clients in graphical format such as deployment status, protection status, as well as protection statistics. Role based administration through eScan Management Console enables the administrator to share the configuration and monitoring responsibilities of the organization among several administrators. Using this feature, pre-defined roles can be assigned to the administrators, each with own set of rights, permissions and groups. With the help of eScan’s Client Live Updater, events related to eScan and security status of all endpoints are captured and recorded / logged and can be monitored in real-time. Also, the events can be filtered to retrieve exact required information to closely watch security level on all managed endpoints on a real-time basis. This allows administrator to deploy outbreak prevention policies during an outbreak that restricts access to network resources from selected computer groups for a defined period of time. The outbreak prevention policies will be enforced on all the selected computers or groups. Incorrect configuration of these policy settings can cause major problems with the computers. Using One Time Password option, the administrator can enable or disable any eScan module on any endpoint for a desired period of time. It restricts user access from violating a group security policy deployed in a network. Note – One Time Password features are valid for endpoints with Windows Operating system only. eScan monitors and logs the session activity of the managed computers with a display report of the endpoint startup/ shutdown/ logon/ log off/ remote session connects/ disconnects. With this report the administrator can trace the user Logon and Logoff activities along with remote sessions that took place on all managed computers. With the help of Active Directory synchronization, the administrator can synchronize eScan Centralized Console groups with Active Directory containers. New computers and containers discovered in Active Directory are copied into eScan Centralized Console automatically and the notification of the same can be sent to the system administrator. Administrator can also choose to Auto Install or Protect discovered Windows workstations automatically. It helps in monitoring USB devices that are connected to Windows or Mac endpoints in the network. On Windows endpoints administrators can allow or block access to USB devices. Unauthorized access to USB devices can be blocked using password protection thus preventing data leakage. Enables to send notifications to the administrator of the web-console when any data (which is not read-only) on the client system’s hard disk is copied to the USB. It allows you to block / whitelist and define time restrictions for allowing or blocking execution of applications on Windows endpoints. It helps in accessing only the whitelisted applications, while all other third-party applications are blocked. The two-way Firewall with predefined rule sets will help you in putting up a restriction to incoming and outgoing traffic and hacking. It provides the facility to define the firewall settings as well as define the IP range, permitted applications, trusted MAC addresses and local IP addresses. 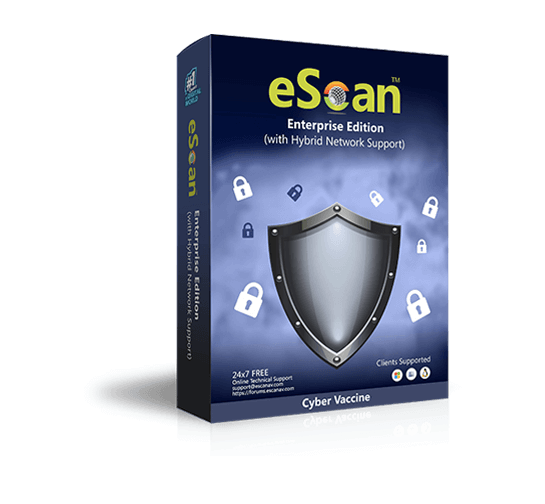 eScan checks the content of outgoing and incoming mails as well as scans all the emails in real-time for Viruses, Worms, Trojans and hidden malicious content using powerful, heuristic driven Dual Anti-Virus engines. Thus, online threats are averted before they enter the network via emails. Privacy control allows scheduling the auto erase of your cache, ActiveX, cookies, plugins and history. It also helps you to permanently delete files and folders without the fear of having them retrieved through the use of third-party applications, thus preventing misuse of data. eScan comes with an advanced Web Protection feature that allows administrators to define the list of websites to be blocked or whitelisted on endpoints connected to the network where eScan is installed. For Windows endpoints eScan also provides the facility for time-based access restriction. eScan offers you an option for scheduled scanning, which will run seamlessly in the background without interrupting your current working environment. It performs scheduled scans for selected files/folders or the entire system for the scheduled period, thus providing you the best protection against cyber threats. Looking for Key Features of MailScan in Enterprise? Here they are! MailScan for Mail Servers uses a combination of technologies like Real-time Black List, SURBL Checking, MX/A DNS Record Verification, Non-Intrusive Learning Patterns and many more to accurately block Spam and phishing emails from entering the corporate network. MailScan scans all the email in real-time for Viruses, Worms, and hidden malicious content using powerful, heuristic driven Dual Anti-Virus engines. Spam images that you receive through mails can infect your computer system. MailScan uses powerful in-built technologies to filter out image spam. With an advanced revolutionary NILP technology, MailScan offers accurate security. It works on the principles of Artificial Intelligence to create an adaptive mechanism in Spam and Phishing Control. OS X Snow Leopard (10.6 or later), OS X Lion (10.7 or later), OS X Mountain Lion (10.8 or later ), OS X Mavericks (10.9 or later) OS X Yosemite (10.10 or later), OS X El Capitan (10.11 or later), macOS Sierra (10.12 or later), macOS High Sierra (10.13 or later), macOS Mojave (10.14 or later). * Some modules will only be available with specific MailScan Versions. e.g. SMTP is available with MailScan for SMTP and Exchange. Other versions does not have SMTP module. MailScan is available in English Language only.